DAVID Smith’s Bulleid ‘Merchant Navy’ Pacific No. 35018 British India Line will make its main line and preservation return this spring in a non-prototypical gloss black livery. The rebuilt 4-6-2 is nearing the end of its first preservation- era restoration at West Coast Railway’s Carnforth headquarters (as exclusively revealed in our sister title Heritage Railway last month), having made its first moves since 1964 at the former Steamtown base on November 29 last year. The one-time Barry wreck began on the road to steam 37 years ago when it left Dai Woodham’s South Wales yard for a new life at the Mid-Hants Railway in March 1980. From Ropley, No. 35018 headed to South Coast Steam in Portland then moved to Carnforth in 2012 to have its restoration completed. The choice of black as a livery echoes that selected for Riddles ‘7MT’ No. 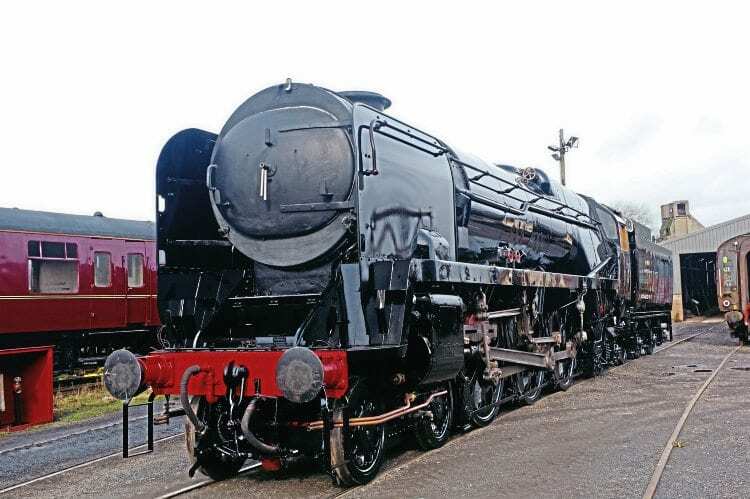 70000 Britannia when that engine’s overhaul was completed by LNWR Heritage in 2011. The BR Standard pioneer ran in unlined black for several months before being repainted into lined BR green, and it is possible that British India Line could follow suit. It will certainly undergo main line trials in the black paint scheme, likely around the Hellifield circuit. However, the West Coast chairman has been known to turn out locos in liveries never previously carried and run them in that guise for an extended period – the BR crimson currently carried by Stanier ‘Jubilee’ No. 45699 Galatea being a case in point.